The Tongariro National Park is a true paradise for walkers, trampers, and nature appreciators alike. It is home to the mountains of Ruapehu, Tongariro and Ngauruhoe, the great mountains of the central North Island’s volcanic plateau. You can walk through stunning alpine landscape shaped by lava flows. Mt Ruapehu offers the largest ski fields in New Zealand during winter, but in summer it takes on an incredible moon like landscape. Ride the lifts to the stunning café located at approx 2010 metres with impressive views, then explore the area at your own leisure. At The Crossing Backpackers we recommend this for all levels of fitness and any age, you can even climb to the top of Ruapehu and check out the crater lake! 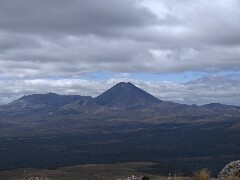 The Ruapehu district offers many guided Lord of the Rings tours throughout the Ruapehu district. Not only do you get to see Mount Doom, Orc Country and the remains of the movie sites, you’ll also encounter beauty with captivating views and scenery. The Hauhangatahi Track is located in a designated ‘Wilderness Area’ or ‘Remote Experience Area’ which means that the track will not be maintained by DOC or the National Park Board. In keeping with such areas, huts, tracks, bridges, shelters will not be made available. Trampers and hunters will have to rely on their skills and experience in negotiating wilderness areas. The track commences at 750 metres on the eastern side of the Erua settlement, which is located about 6 km south of National Park township. Walk south along the right side of the railway line for about 500m where you will see the track signposted on the bush edge on the other side of the line. From here, the track climbs through native forest of beech, kamahiand rimu. The track is marked by the occasional coloured ribbon tied to trees. There is much undergrowth due to the track not being maintained, and in places is quite rough and steep. Further up, kaikawaka (mountain cedar) is evident in places where the track levels out to emerge from the forest at 1150 metres. The average time taken to reach here is 1 hr. 10 mins. At this juncture, the trees revert to scrub and tussock, and the terrain becomes marshy, with a number of tarns encountered. Close watch must be kept for marker ribbons on shrubs, and the occasional snowpole. Up ahead from the bushline can be seen the summit of Hauhangatahi. While it may seem close, it is actually 3 km distant as the crow flies. Due to the marshy ground, and the need to keep an eye out for track markers, the going is quite slow here. To the south, the peak of Mt. Taranaki/Egmont is visible in clear weather, seen beyond the bush-clad Taranaki high country. At about 1350 metres, the terrain consists of patches of tussock, bare ground, and rock and here the track is marked by snow poles. Higher up, and after a small rock-scramble, the summit is attained at 1519 metres. Until now, the volcanic peaks of Tongariro National Park are hardly seen, but the summit reveals them in full splendour – to the right is the Ruapehu massif (2797 metres) rearing up from only 6 km away, and further north views of the peaks of Ngaruahoe and Tongariro are unimpeded. To reach here from the bushline takes about 2 1/2 hours, excluding stops. It is hard indeed to tear oneself away from such a view, but the return trip can take 2 1/2 to 3 hrs. Care should be taken on the final leg when walking down through the forest, where footholds can be tricky in the undergrowth. Note: This is an alpine experience, and warm clothing, wet weather gear and good footwear is essential for safety, particularly in cold weather. The markers may not always be easy to spot, so a compass would not go astray on this track. Remember, this is a wilderness area, and it is expected that you will go well prepared. The times given here are generous – DOC information gives under 3 hours to reach the summit and less than 2 to return, but these times would be achieved only by very fit trampers. Described elsewhere as “a gentle walk to the top of Pukeonake suitable for families with children aged 6 up”, the gentleness – and time taken (30-60 minutes) – depends on whether, water has scoured sections out of the track, or caused slips. To get there, go north on SH 4 and turn right onto SH 47. Turn off at Mangatepopo Rd (which is where the Tongariro Crossing starts) and stop on the right, about 50 m short of the road-end carpark. Behind the barren space (unmarked) where you park your car, the rather rough and wild track leads you towards your goal – Pukeonake. Keep your eyes open for where the walk track veers uphill to your left, as track damage can make this section easy to miss. At 1225 m, Pukeonake is the Plateau’s lowest crater. Overlooking the flat lands to the west, it’s a small scoria cone – just a baby at the edge of the Plateau. 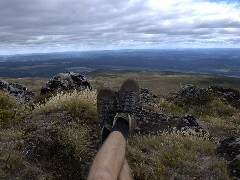 After less than an hour’s walk to the top, you will be overlooked by Ngauruhoe, Tongariro and Ruapehu. These giants are still active volcanoes; little Pukeonake is inactive but has its own magic. Its broad shallow crater holds myriads of tiny plant life – native and exotic – and is a great place to linger and eat your lunch while you admire the three big volcanoes on one side and the flatter landforms on the other. This is variously described as a 2-3 hour loop walk, a 2-hour walk, and a 1.5 hour walk. The 3-hour option allows plenty of time for photography, lunch, dips in the chilly river pools, and generally enjoying the area. And if you think you’ve found beautiful red orchids under the trees, you probably haven’t – it’s stinkhorn (Aseroe rubra), with a very pretty but evil-smelling fungal fruiting body that attracts flies with its filling of brown goo, so they will pick up and spread its spores. To get there, go north on SH 4 and turn right at Owhango. The loop track, which is between Owhango and the Whakapapa River, is well sign-posted at the carpark/picnic area just before the bridge. The track, which is mainly excellent, with only short narrow steep sections, goes through stands of magnificent native trees. Sometimes you are alongside the river and other times deep in a primeval forest, on one of the best bush walks in Aotearoa-New Zealand. 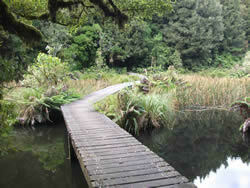 A short boardwalk crosses the water-lilied Ohinetonga lagoon, after which the track crosses the road, leading through more forest (on a rougher steeper track) and back to the carpark. The Tongariro National Park is a true paradise for walkers, trampers, and nature appreciators alike. 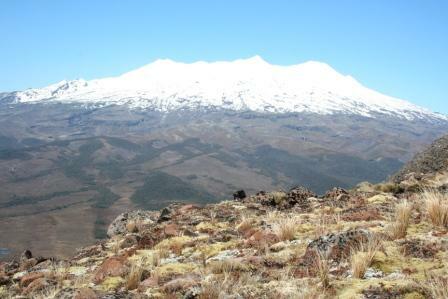 It is home to Ruapehu, Tongariro and Ngauruhoe, the great mountains of the central North Island’s volcanic plateau. You can walk through stunning alpine landscape shaped by lava flows. Mt Ruapehu offers the largest ski fields in NZ during winter, but in summer it takes on an incredible moon like landscape, ride the lifts to the stunning café located at approx 2010mtrs with impressive views, then explore the area at your own leisure. At The Crossing we recommend this for all levels of fitness and any age, you can even climb to the top of Ruapehu and check out the crater lake!